Interesting post, Scott. This is more fear being brought up by concerns of fracking oil patch high yield issues. This is but a small portion of all issues. I had just bought some Vanguard High Yield Corporate Fund VWEAX. Goldman Sachs issued a report on the high yield bond market in this same vein a couple of weeks back. SCOTT…...This is NOT a reference to swap spreads but I do have a question…..Why is it that the investment markets whack out to the downside when oil goes up (which seems to hammer the consumer and business in general) and THEN when oil drops like a rock and the consumer and business seem to be able to retain more of their own money the markets and especially the media whack out and create tons of "drama"??? causing the investment markets to get smacked to the downside!!! The long term picture would seem to me to be very favorable for both the consumer and business in general. Thanks for ALL the excellent data and info you provide. zumbador: to answer your question, my best guess is that the market is just plain nervous. 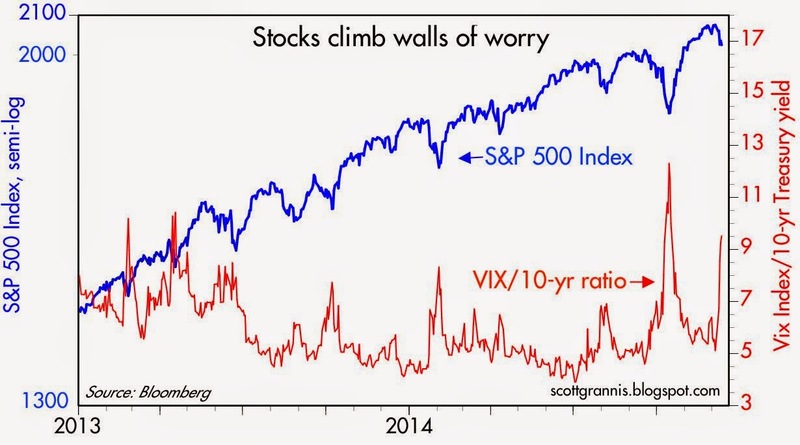 Risk aversion is still everywhere, but it has gone down a few notches. Nevertheless, the stock market has gone up so much that there is lots of concern that something, whatever, will trigger a big selloff. A big drop in oil prices is a shock to many (big changes always create nervousness), and so it's fertile ground for panic. But in the long run I think things will sort out for the better. Another place to look for yields is in the mortgage REIT market. I suspect we will see very low inflation and interest rates for many years. But some mortgage leads are offering near double-digit yields. I've been trading corp HY successfully for over 20 yrs and I can tell you emphatically that it is a very emotional trend driven market. aka when prices are falling, DO NOT BUY!. the entire market is maybe $1.5T and that is up 50% this year. so it is quite illiquid-which is why it trends so well. I'm optimistic I'll get a nice entry point sometime in near future but I'm not going to try and pick a bottom. 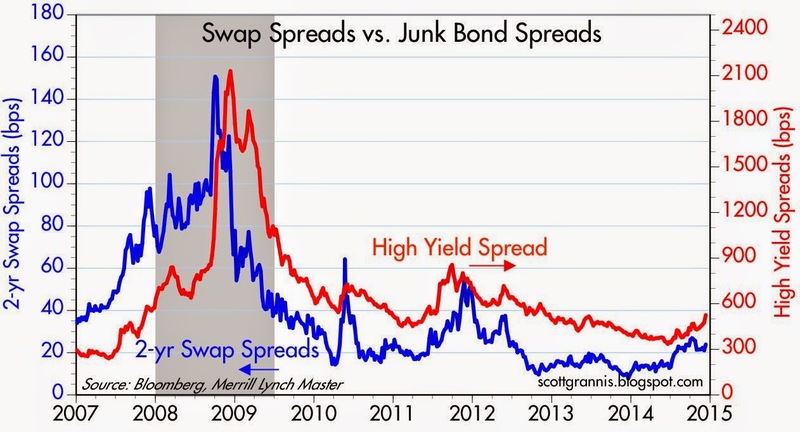 BTW, it is also remotely possible that HY is foretelling further turpitude in the future is in '08. I do NOT expect it but this is how these bonds behave during crisis. 12/11/2014 - Composite leading indicators (CLIs), designed to anticipate turning points in economic activity relative to trend, point to continued weak growth in Europe but stable growth in most other major economies and in the OECD as a whole. Amongst major economies stable growth momentum is anticipated for Canada, the United States, Brazil, China and Russia. The CLI points to growth losing traction in Japan though this may be related to one-off factors. Within the Euro Area, the CLI continues to point to a loss of growth momentum, with stronger signals of a slowdown in the case of Germany and Italy. In France however the outlook continues to suggest stable growth momentum. The CLI for the United Kingdom indicates that growth may ease, albeit from relatively high levels. India is the only major economy where the CLI points to a pick-up in growth momentum. SALEM, N.H. — John York, who owns a small printing business, nearly fell out of his chair the other day when he opened his electric bill. For months, utility companies across New England have been warning customers to expect sharp price increases, for which the companies blame the continuing shortage of pipeline capacity to bring natural gas to the region. completely off subject but to william's point, we live on lake winnipesaukee in NH (read COLD) and energy is expensive. virtually everyone up here uses propane as there are no nat gas pipelines (NH residents don't like to tear up the scape) and that stuff is crazy expensive. add in the electric bill and yeah you don't want to be penurious and live here. that said, I am NOT shutting down the hot tub!